A few years back the thought of having electric trailer brakes sent shivers down my spine. They were fiddly, jolty and had a tendency to either lock the brakes up or not apply enough braking force when you needed it. If I’m totally honest, they were a real pain in the backside! But I’m happy to admit the modern electric brake controller is a whole new breed. There's a lot less guess work and much more reliability these days, especially when you look at some of the top dogs in the industry, like the TowPro Elite unit from Redarc. This particular unit offers two types of braking; proportional and a user-controlled mode, which comes in super handy out on the tracks if you ask me. 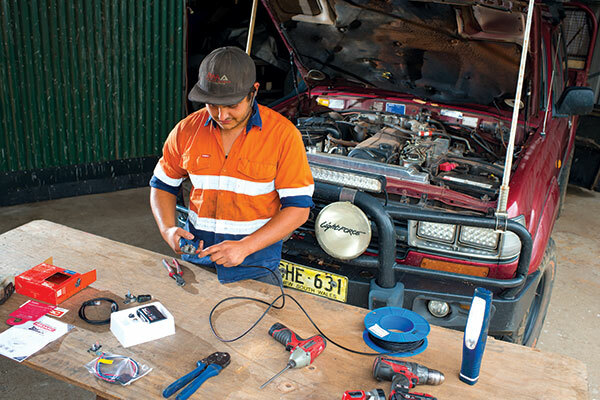 So I got my local electrical guru and all round nice guy, Blake from Blake’s Mobile Automotive, to bung a TowPro Elite into my old 80 series LandCruiser. 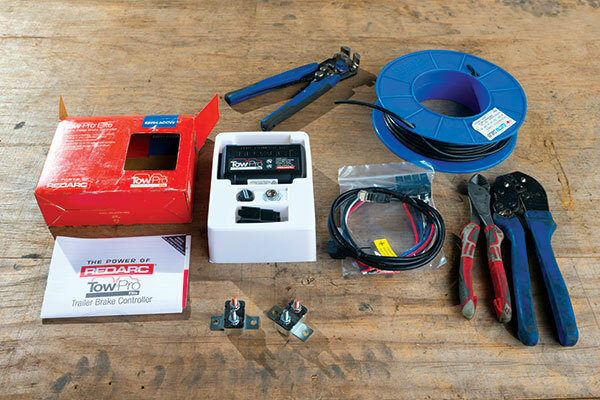 While he was at it, we thought we’d run you through a few basic tips for installing your own electric brake controller too. There are hundreds of different electric brake controllers out there on the market, but we can effectively break them down to two main types; “proportional” and “time delayed”. What’s the difference? Let's look at the “time delayed” option first. 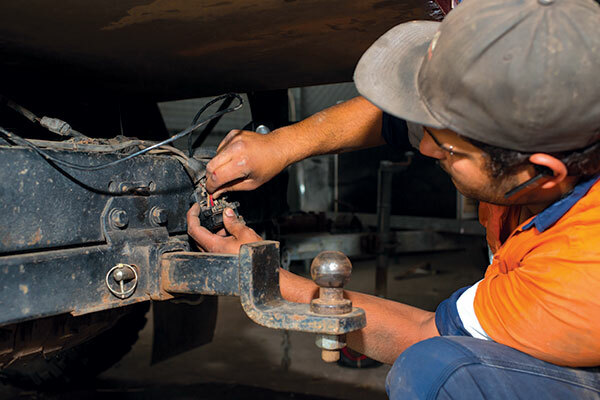 In a nutshell, when you apply the tow vehicle's brakes, it triggers the controller to apply a pre-set level of braking voltage after a specified amount of time. The trouble is it always applies the same level of braking force regardless of how much brake force is required in a given situation. That’s a big pain in the neck when you’re traversing different types of terrain at varied speeds. You’ve basically got to adjust the time and/or power controls manually, so there’s a lot more user intervention. On the plus side, they’re proven to be a robust bit of gear. Proportional brake controllers are much more advanced in their approach. They sense the rate at which the vehicle is slowing down and apply a proportional amount of voltage to the trailer's brakes. There’s much more to the story, and plenty of tricky calculations to be made, but the idea is the trailer will slow down at the same rate as the tow vehicle. The result is much less jerking around, nowhere near as much user intervention required and much more efficient performance. Plus, it reduces the amount of wear on each vehicle's brake systems in the process. I’ve used the Tow Pro Elite a fair few times over the last year or two, and honestly I can’t fault it. So naturally, when it comes to kitting out my own vehicle it was a pretty easy choice. There are a few things I really like about it. It's compact, so it doesn’t take up space on your dash and can be mounted in easy to reach locations. The second is its ability to be switched from “proportional” or “user controlled” braking modes. Yep, you read that right; this unique feature lets you choose the best braking style depending on the road or terrain conditions, vehicle type, or driver preference. For me, I love the ease and convenience of a proportional brake controller when I’m on the bitumen. But when I’m on the trails, I like to switch it over to manual mode. I find I get a lot more versatility that way, mainly because I often need to activate the trailer's brakes independently to the vehicle. Before you get started, it’s best to make sure you’ve got everything you need to complete the job. Now our chosen brake controller kit included the main components required, apart from some extra electrical cable (we used 6mm double insulated cable). But the team at Redarc actually stock specialised plug and play wiring kits to suit specific vehicles too. If they make one for your vehicle, that’s definitely a good option to save time and ensuring a quality installation. Before you run any electrical wiring, it’s best to mount the main components up first, but this will require a bit of prior thought. For example, when it comes to installing the main control unit, it needs to be fastened securely, preferably using mounting screws – no dodgy cable ties or half-arsed attempts will suffice. Why not? Well, the main unit actually sensors things like vehicle speed, direction and braking force. If it’s not firmly attached in a fixed location its readings maybe compromised, which could result in incorrect braking of the trailer. The real beauty with these particular units is you can mount them in any orientation, which you can’t do with most other proportional brake controllers. The system will calibrate itself to find its bearings, just make sure it’s in a safe location. For example, I have a tendency to take the Cruiser swimming through rivers, so we mounted it up high behind the dash just in case I bite off more than I can chew! Next up, install the dash mount controls in a nice and easy to reach location. Find a spot that’s clearly visible, so you can reach for it quickly if need be. Another thing to consider is the amount of room available to mount the in-dash controls. 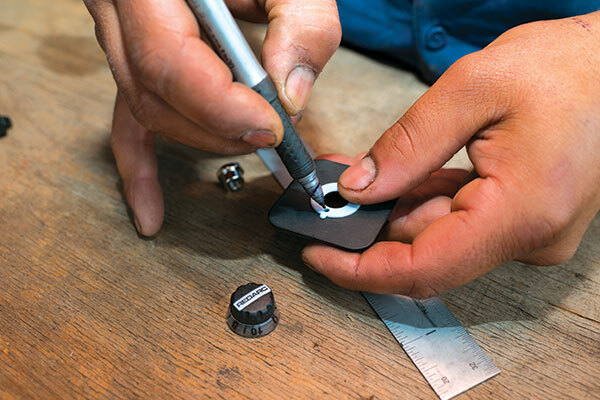 While the control dial itself is only small, the electrical plug that connects to it is actually quite bulky – trust me, you don’t want to drill the hole, mount the dial then realise there’s not enough room to plug it in. Plus, you’ll want to make sure the dash material isn’t too thick, which can affect the operation of the brake activation button. To mount the dash controls to the trim, you’ll need to drill a second locating hole to ensure the unit doesn’t spin when you turn the dial too. There are two wires you should wire up first before there’s any power connected. 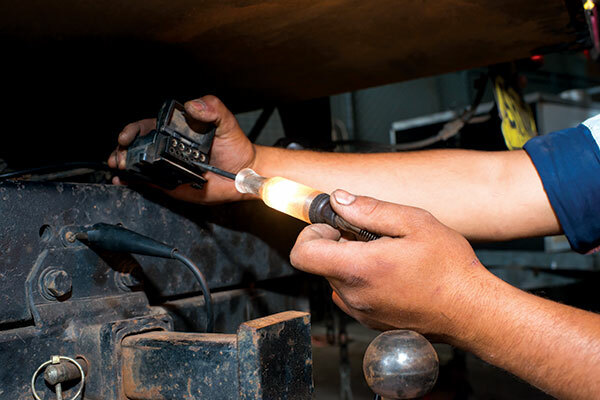 One is the signal wire coming from your brake lights, which you can usually get from the brake light switch located on top of your actual brake pedal. This cable will basically tell the main unit that you want to activate the trailer brakes. The other electrical wire is the output cable, which will need to be run between the main control unit and the trailer brakes, or the trailer plug to be more accurate. Simply run it into the designated pin on the trailer plug and lock it in with the securing screw. To supply power to the brake controller unit itself, you’ll need to run a positive and negative electrical cable from the main unit to the battery via a circuit breaker, which mounted as close to the battery as possible. Twin core wiring is the easiest to work with in this case. Obviously, you’ll need to pass the electrical cables through the vehicle's firewall, so make sure you use existing holes to ensure structural integrity is maintained, with rubber grommets so the wires don’t rub against metal. A good habit to get into is to leave it disconnected at the battery until the very end of the installation so you can’t accidentally earth anything out while fiddling with wiring. When it’s all done and dusted, you can check the brake controller is working without actually hooking a trailer on the back. 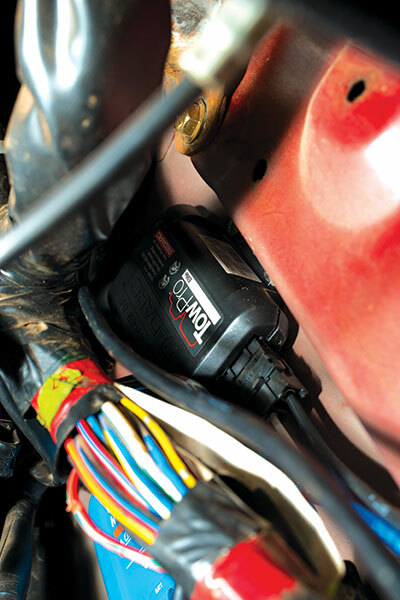 Simply use a test light to probe the auxiliary brake pin on the electrical tow plug and activate the brake controller. The test light should illuminate, and the light should intensify as you wind up the dial (the voltage increases). If it’s all working as it should, grab yourself a cold beer – you’ve earned it! Obviously, you’ll need the wiring side of things to be top notch for the unit to perform reliably and correctly. So when it comes to joining the wires, don’t be dodgy. In fact, here’s a fun fact for you; under full braking force a trailer can draw as much as 25A. So while it might not draw that much for your typical single axle box trailer, the wiring must be adequate to handle the current required to operate up to a Tri-axle trailer too. 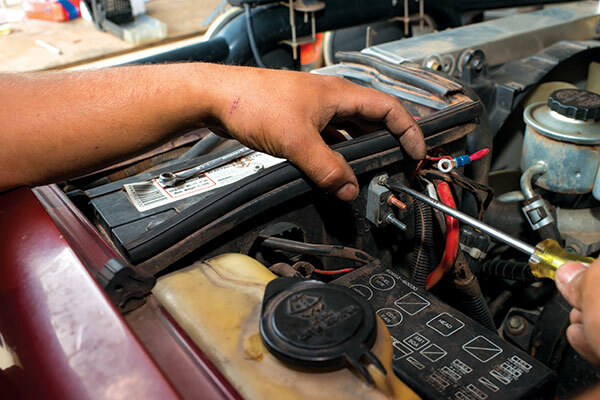 The same goes for any electrical connections, which means your everyday blade fuses or crimp terminals aren’t going to cut the mustard. Nope, you’re far better off soldering any electrical connections and sealing them off with heat shrink. While you’re at it, wrap the wires in conduit for a little extra added protection. When you’re hooking a U-turn on a tight track, the ability to jack-knife the trailer in a hurry can actually come in pretty darn handy. A little trick is to activate the trailer brakes independently as you reverse, which helps hook the trailer around quicker. If the trailer's weight is pushing hard against the tow vehicle on a descent, it can cause the trailer to slide sideways. The extra weight can even cause the tow vehicle's wheels to lock up if you have to hit the brakes. Activating the trailer's brakes independently to the tow vehicle can help keep the trailer steady, by pulling it backwards to straighten it out. If you’re tackling the sand it’s a good idea to turn the trailer brakes right down. Trust me – you’ll have your hands full with the resistance from the sand without worrying about the brakes slowing you down too quickly. Check out the full feature in issue #122 of Camper Trailer Australia magazine. Subscribe today for all the latest camper trailer news, reviews and travel inspiration.